First up is a simple demo of a single basic sound - a pulse taken from an Eardrill Pendulum Ratchet 077 module. I chose this because it was the simplest sound in my 200e kit and I could also use some of the divisions from the 077 to trigger and modulate other things in the patch to make things a bit more interesting. The audio demo is tame by FoH standards but it gives you an idea of some of the cleaner qualities of the phaser. It starts with the simple pulse out and some manual tweaking of the input and gain on the module. Eventually I start to use the modulation inputs and throw it into an envelope to get things cooking a *bit* more. You can hear a the phaser sweep it's highs and lows rather politely with an occasional more juicy moment or something with a bit more grit. This audio demo is a bit lower in volume but has it's more raw and peak moments. I'm using a simple waveform out of the 261e into the PB. 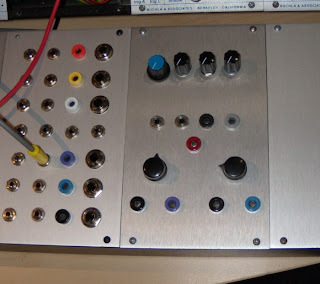 There is some manual and CV tweaking including running the mod oscillator into one of the DIY attenuators I made on the module and manually tweaking and feeding that into the Gain CV input on the PB. For those interested here is a bit more info on the module itself. I'll do a more involved post on the DIY nature of it and tapping into the 200e power buss board etc in a future post. The layout of the module is very simple. The FoH Plague Bearer barebone pack comes with a preambled and soldered PCB and has the four main pots already attached. The bottom section contains two DIY attenuators with the black banana jack being the Input, the colored jack being the Output, and the knob in between adjusting the amount of attenuation. After experimenting a bit I chose to use a B500K pot and a B1Meg pot to get the most flexibility and mix things up a bit. Given the sensitivity of the Input and Gain knobs and Gain CV input these come in very handy. So there you have it. A strong filterlike phaser freaknoisepiece mixing with some sophisticated 200e modules. I look forward to seeing how everyone plays nice once I get my 250e and 266e back from repair in a week or so and will have more posts and demos then.